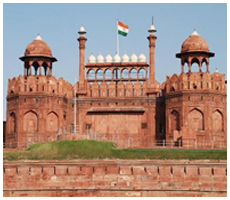 After breakfast, moved to Historic Monument Red Fort- built between 1638 - 1648 with marvellous red stone, Jama Masjid- the principal mosque in India was built in 1650 both are constructed by Mughal emperor Shah Jahan, Chandani Chowk- a shopping hub you can enjoy Rickshaw ride in Chandani Chowk. Rajghat- interment site of Mahatma Gandhi (Father of the Nation). President House- earlier recognize as Viceroy’s House was built in 1921, now the authorized residence of President of India. India Gate- war memorial built in 1931 and designed by Sir Edwin lutyens. Humayun’s Tomb- Humayun specially made this tomb for his wife Hamida Banu Begum in 1562 (UNESCO World Heritage site), Lotus Temple- also known as Baha'i house of worship, Qutub Minar– UNESCO World Heritage site was built in 1192 by Qutub-ud-din Aibak. Overnight at hotel. 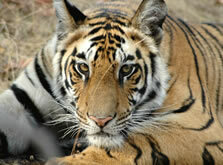 After breakfast, drive to Sariska Tiger Reserve- famous for Tiger population, Historical places, great Flora and Fauna. On arrival transfer to the hotel, after relaxation visit Sariska Tiger Reserve for Jeep Safari with naturalist guide to catch the Tigers and others wild animals. In this national park you see Tigers, Leopard, Chital, Golden Jackal, Four-horned antelope, Indian gazelle, Nilgai, Sambar deer and etc. That is opportunity you can take pictures of animals in their natural habitat. Overnight stay in hotel. After breakfast, again visit Sariska Tiger Reserve to enjoy the Jeep Safari/ Canter Safari with naturalist guide, to complete the full sightseeing of this national park and take more pictures of wild animals. After lunch visit Kankwadi fort- known as Kankwari, built in 17th-century by by Jai Singh II. 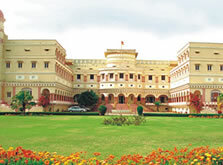 After that visit The Sariska Palace- famous for it's French and regal architecture, built by Maharaja of alwar and now it is converted into Heritage Hotel. In the evening drive to Jaipur, on arrival transfer to the hotel for overnight stay. After breakfast, explore Jaipur- the Pink City of India, visit Amber Fort- it was built in 16th century, enjoy the experience of elephant ride, Hawa Mahal (Palace of Winds)- built by Maharaja Sawai Pratap Singh in 1799, Jantar Mantar- an astronomical observatory site built in 18th century by Maharajah Jai Singh II, later drive back to visit imperial City Palace- a miraculous palace to witness the real Rajasthani and Mughal architecture of Jaipur built in 1729 by Sawai Jai Singh II and later visit City Palace Museum. In the evening enjoy rickshaw ride to explore the colorful market of Jaipur. Overnight at hotel. After the breakfast drive to Ranthambore- famous for good density of Indian Tiger with incredible species, on arrival transfer to the wildlife resort. After relaxation enjoy Jeep/Canter Safari with naturalist guide at Ranthambore National Park. In this sanctuary you can also see Chital, Sambar, Nilgai (blue bull), Langur, Chinkara, Hyena, Pythons, Crocodiles, Leopards etc. That is opportunity you can take pictures of animals in their natural habitat. Overnight stay in Ranthambore. After the breakfast visit Ranthambhor Fort- this fort is built by Chauhan ruler in 944 and later drive to Bharatpur- famous for bird sanctuary. On arrival transfer to the hotel. After relaxation visit Bharatpur Bird Sanctuary- the home of 380 species of birds in the 29 sq km stretch of land, also famous for astonishing &comprehensive and known as Keoladeo National Park. Later enjoy the rickshaw ride and also visited famous Lohagarh fort- one of the strongest monument in India, built in 18th century by Maharaja Suraj Mal. In this fort you will see historical three places, Palace of Badan Singh, Kamra Palace and Mahal Khas. Overnight at hotel. After the breakfast drive to Agra, enroute visit Fatehpur Sikri- this place is incredibly famous for its monuments built in Mughal Era. On arrival visit famous Buland Darwaza- built in 1575. Later move to Agra, on arrival transfer to hotel, after relaxation enjoy shopping of Handicrafts items and see Leather & Stone factories of Agra. Overnight at hotel. Early in the morning, you will be the witness of most memorable view of Taj Mahal at the time of sunrise. Return to hotel for breakfast and again visit Taj Mahal- UNESCO World Heritage Site and one of the seven wonders. It was built by Mughal King Shah Jahan for his wife Mumtaz Mahal in 1652. Taj Mahal the symbol of love eternally, the most famed evergreen monuments in the world. After lunch visit Agra Fort- inbuilt marvellous red stone by Mughal King Akbar the great in 1573. In the evening drive to Delhi and on arrival transfer to the hotel for overnight stay. After breakfast enjoy the elephant safari to explore the natural beauty of Corbett National Park. Later back to resort for lunch, after lunch again visit national park to enjoy Jeep/Canter Safari with naturalist guide. In this national park you can also see Bengal tiger, Jungle Cat, Spotted Deer, Bull Elephant, Sambar Deer and etc. You can take pictures of animals in their natural habitat. Overnight stay in resort. After breakfast, visit Corbett National Park enjoy Jeep Safari or Canter Safari with naturalist guide, to complete the full sightseeing of this national park and take pictures of wild animals. In the afternoon drive to Dhikala Forest Lodge, on arrival transfer to the Forest Lodge and rest of the evening is free for leisure. Overnight stay in Lodge. After breakfast explore Dhikala Forest Lodge- known as paradise of Forest and wild animals lovers. 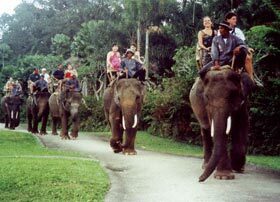 In this forest lodge you can enjoy the view of wild animals watching with Elephant/ Canter Safari. In this forest area you can see Tigers, Barking Deer, Spotted Deer, Barasingha, Monitor Lizard, Fox, Elephants, Sambhar and etc. Later visit Ramganga River to view the Indian Crocodile. Overnight stay in Lodge. After breakfast drive to Delhi, on arrival transfer to the international airport to board the flight for hometown and tour concludes with happy memories.